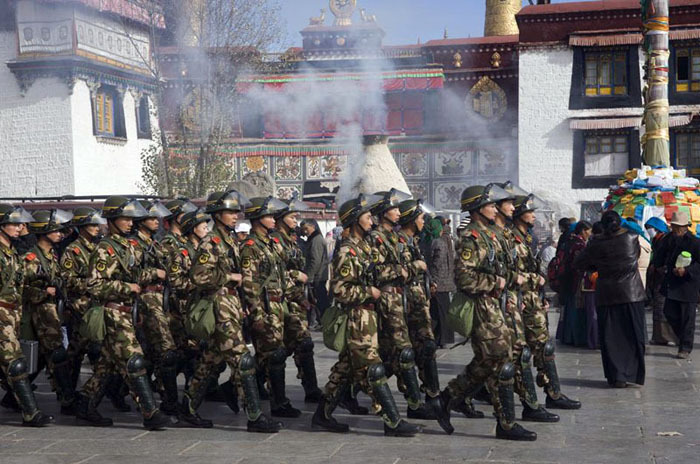 (TibetanReview.net, Feb12’19) – China said Feb 10 that its local government in Tibet Autonomous Region (TAR) dealt with 25 cases involving inciting separatism or financial crimes which jeopardized national security in 2018. The official globaltimes.cn media website, which reported it, did not give details about any of those cases. That was because the main focus of the news story was that Tibet’s capital Lhasa had topped a list of safe “Chinese” cities which was stated to boast more than 100 police stations that could respond to emergency calls within one minute. The point of stating this was to report on the state of preparations to deal with law and order situation. However, it also reflects the height of China’s preparedness for swift crackdown on any incident of Tibetan protest against Chinese rule. Rapid economic development coupled with merciless repression of all dissent remains the cornerstone of China’s policy in Tibet. The report cited Tibet Daily, the local party mouthpiece, as saying Feb 8 that a recent blue book published by the Chinese Academy of Social Sciences on the public services in 38 Chinese cities showed that Lhasa ranked first in terms of public safety. The report said Lhasa had more than 100 police service stations that could respond to emergency calls within one minute in core areas and three minutes in other areas. The report cited the local government as saying in its 2019 work report, released in January, that the sense of security and satisfaction of local residents had reached more than 99 percent, and that the number of accidents and deaths had decreased 16 percent and 21 percent respectively. The report said the region had dealt with a total of more than 30,000 cases in 2018, with 25 of them involving inciting separatism or financial crimes which jeopardized national security. The local government was reported to have vowed in its 2019 government work report to strengthen social governance and maintain social harmony and stability, deepen the anti-separatist campaign and crack down on separatist and sabotage activities, and enhance the border management.